Is race something we wear on our faces? Does it lie our skin colour, place of origin, or ancestry? Is it tangible? Two online exhibits challenge these ideas. The White Australia Policy began in 1901. Years of xenophobia and racial tensions, caused by increasing immigration, labour disputes, and competition in the Australian goldfields, fostered the passing of the Immigration Restriction Act in the newly formed Australian Parliament. Australia was to be a visibly ‘white’ place. The Act was only the beginning of the White Australia Policy, a series of laws that encouraged and privileged ‘white’ British migrants. These systems discriminated against Indigenous Australians, Asians, and non-caucasian Europeans, making it difficult and almost impossible for them to integrate freely into Australian society. As a result of their skin colour, non-caucasian immigrants were monitored by the Australian government and part of this monitoring involved portraiture. Mug shots and portraits have a long history of being used by institutions as a form of surveillance and record keeping. Through portraiture, individuals on the margins of society were often categorized into groups based on variables such as geography, ancestry, health, physical apperance, economic status, and skin colour. Following the Act, immigrants to Australia in the early twentieth century were classified and monitored by the government by their race, place of birth, skin colour, eye colour, and build. Despite the White Australia Policies being dismantled by 1973, extensive documentation remains, shedding light on these past discriminatory practices. The real face of white australia is a thought-provoking and innovative website, created as part of the Invisible Ausralians project. The experimental browser showcases, in random order, portraits of individuals who were monitored by the Australian government. Using a facial detection script, the creators of the website extracted portraits from thousands of government documents. You can read about the specifics of the program here. The finished product, an experimental browser, allows the user to “explore the records of the White Australia Policy, through the faces of those people.” Not only can users view the faces of those afflicted, they can also click on each portrait to view primary sources associated with the respective individual. This practice gives users a chance at analyzing some material aspects in 2D; stamps, signatures, and wear and tear are visible on the digitized documents. Screenshot of document view, “Certificate Exempting from Dictation Test,” from April 1909, for a man named Joseph, hailing from Syria. It lists his complextion as “dark” as well as his eye colour, hair colour, and build. Screenshot of document view, “Impression of Left Hand” included alongside a portrait. Mainwhile in Brazil, artist Angelica Dass is in the process of creating a “chromatic inventory” of human skin tones, a project that destabilizes contemporary understandings of race and colour. 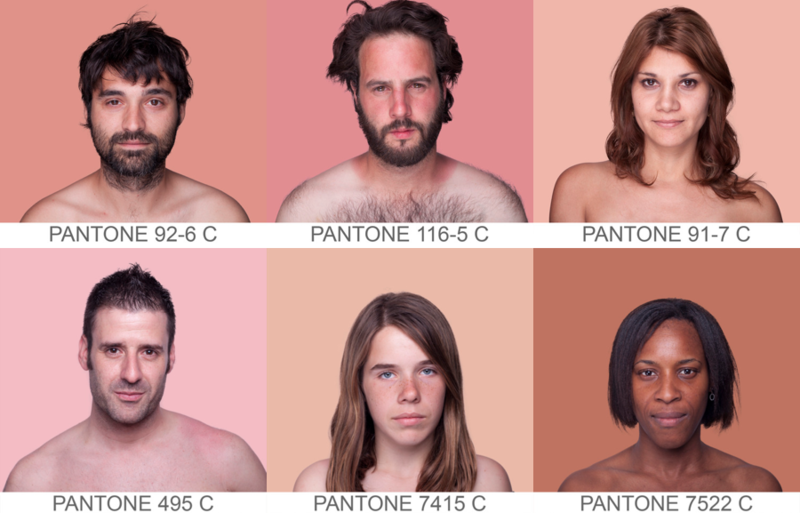 The humanae project involves capturing portraits of people of all ages, sizes, and ethnicities, and matching their skin colour to a ©Pantone colour shade. Dass accomplishes this by taking an 11×11 pixel sample of her subject, and uses the sample to colour the background of the portrait. The background colour is then matched to its respective Pantone shade. People as paint chips? Can you find your match? Dass comments that her “utlimate goal is to record and catalogue, through a scientific a measurement, all possible shades of human skin.” This neat art project is in the process of becoming an archive of human colour. Both The real face of white australia and humanae subvert ideas of race and colour through visual representation with the help of portraits. The real face website unleashes historical images from the archive, shaping them into an online exhibit through a narrative of surveillance and discrimination. Angelica Dass’ work on humanae is literally a living archive – a repertoire of anonymous human faces – that strips the boundaries of race and skin colour. Hundreds of unique colours and faces join together. These websites demonstrate how race is very much a social construct. A series of mysterious doodles featuring crop circles and unidentified flying objects appeared between 5th September and 21 September 2009.
for less when stores start their “beginning of summer” sales. It has come a long way over the past 70 years – from a small carpenter’s workshop to a modern, global enterprise that is now, in terms of sales, the world’s sixth-largest manufacturer of toys.